Atole apparently has its roots in Mayan cuisine and I’m sure the earliest incarnations of the hot drink, like Mexican hot chocolate (called champuraddo), were thickened with coarse cornmeal. But as modernity surged forward, the taste for lumpy drinks likely gave way to the smoother beverage served today. Although for curious cooks out there, it’d be interesting to try this with grinding the same quantity of cornmeal to a fine consistency in a blender and cooking the atole the same way. Once I had seen atole, I started noticing it in different incarnations, some with fruit added and others infused with pecans or cinnamon sticks. 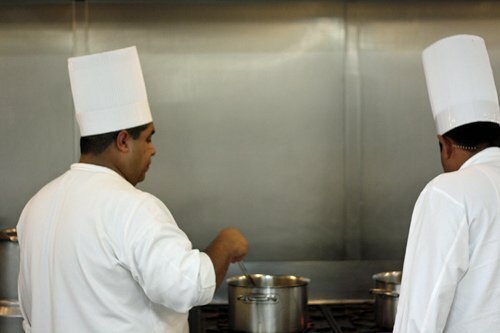 So I asked the chefs at the hotel where I was staying, if they would show me how to make it. And they invited me into their kitchen one morning to join them in whipping up a batch. They had a few plump Mexican vanilla beans ready and waiting, which are my favorite kind of vanilla. Whenever I see a vanilla bean, the first thing I do is pick it up and inhale deeply. I just can’t help it. The chefs smiled at the odd stranger in their midst, then took their knives and split the pods lengthwise, scraping out the moist clumps of seeds to add to the drink. They pretty much put everything into one big pot, cranked up the heat, and whisked like mad for a few minutes until the steamy atole was rich and thick. When I picked up the Mexican vanilla beans that they were using, which are my favorite kind of beans and extract, and took that big sniff, that was another reason why I like this country so much. Like those preconceived notions I had, Mexican vanilla got a bad rap because of all the cheap imitations, that bear no resemblance to the real thing. 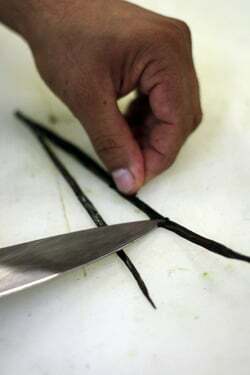 Mexican vanilla is considered by many to be the best in the world and although it isn’t cheap—unlike those imitation “pure” vanillas sold to tourists for a dollar (some contain toxins)—true Mexican vanilla has the scent of heavily scented vanilla custard; complex, elusive, and familiar at the same time. I buy it by the quart from a reputable source and use it as my ‘house’ vanilla. While in Mexico, I’ve had to curb my normal habit of trying to block others from cutting in front of me (I traded my Parisian shopping basket for a beach bag as my tool of choice in Mexico) and tried to slow down a bit from the hectic pace that’s normal in Paris. But something I learned about myself after a few days on a nearly deserted beach was that although I didn’t have to do much to keep people from line jumping, I wasn’t very good at relaxing. Perhaps I’m more Parisian than I thought. So in addition to learning about atole, I think on my next trip I need to learn to relax—and drink more atole—if I want to consider myself even remotely Mexican. This recipe makes quite a bit and you’re welcome to cut the recipe in half. 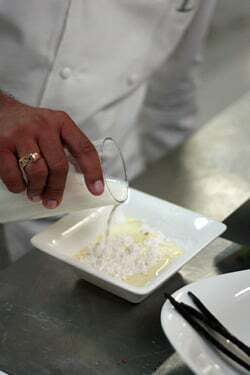 The chefs told me that sometimes people use rice or oat flour in place of the corn starch. To get the seeds out of a vanilla pod, split the bean lengthwise and use the blade of the knife to carefully scrape out the seeds. The pod should be reserved for another use, such as infusing poaching liquid or tucked in a bin of sugar to perfume it.They don’t use much sugar in their atole but you might want to increase the amount to taste. If you can get Mexican piloncillo sugar, this is a good place to use it. 1. In a medium bowl, whisk together the corn starch with about 1 cup (250ml) of the milk until the corn starch is dissolved and there are no lumps. 2. Pour the rest of the milk, the sugar, and the vanilla seeds into a large pot, then gradually whisk in the corn starch mixture. 3. Cook the mixture at a boil over medium-high heat, whisking constantly and vigorously, until the atole is thickened to the consistency of runny pudding. It will take about two or three minutes. 4. Remove from heat and strain the atole through a mesh sieve before serving it. Serving: Atole is served warm. If made in advance and you wish to reheat it, it will likely thicken quite a bit. If so, add some additional milk to thin it out. Mmm, looks delicious! I’m bookmarking this to try later! Kind of looks like breakfast pudding! Can’t wait to try! This is making me want to go to Mexico ASAP! Of all the times I have been there, I have never tried Atole. Thanks for sharing! What a lovely post, David. It is nice to read something positive about Mexico for a change. What a shame that drugs and violence have marred such a beautiful country. I grew up here, in Texas, having what my mother called atole from time to time. Ours was a little different, in that it did not contain corn, but rather wheat. It was delicious just the same. I look forward to meeting you Saturday and hopefully reading about your adventures in Texas. Peace and atole! I mostly drink atole in the markets at Oaxaca! it looks so wonderfully silky in both that pour shot and in the cup at the end there – i’d never have guessed a maize-thickened drink could develop that texture! i’ll have to give this a try. on line jumping, i recently reread a david foster wallace passage (and a mary karr piece that references him) on how unfortunate it is to think of other people as traffic. i do it all the time, but i’m trying to reform! good on you re: your slowdown in mexico. The down side of having room service every day: I missed the atole! Looks comforting, I will just have to make it at home. Judy: Yes, I’m told it’s a popular street food in Mexico. Clearly I need to eat more exploring in Mexico! Delia: Unfortunately bad things happen everywhere, as we’ve seen on the news in the US this week. And I know people from outside the US who are afraid to go to New York City or Los Angeles because of the programs they’re seen on American television. (Heck, I know people even afraid of coming to Paris.) I tend to concentrate on the food so stay out of trouble wherever I go..
Atole is served in some Central American countries as well. My favorite includes corn kernels in it…yummy! BTW, I love and want those little blue rimmed jars! They are the cutest! While you are in Austin, you would be doing yourself a favor by eating dinner at Fonda San Miguel. It is a beautiful restaurant with amazing art and food from interior Mexico. It is consistently given top ratings here in town. I don’t work there or have any affiliation with them, as Ree would say, they don’t know me from Adam (or Adan)! It is really just my definition of Austin. Printed this for my recipe binder. Thank you! Especially for the photos. Wow, David! I totally missed that cauldron at breakfast. Too focused on all the amazingly varied frutas. Sounds like it would make great winter comfort food here in frigid NYC. Wylie: It was hard to notice is amongst all the Mexican foods and juices on offer. Fortunately I had to peer into everything before making my choices and noticed the atole. Maybe someday you’ll get some ‘couchsurfers’ from Mexico and they’ll whip up batch for you one morning! Thank you for posting this Mr. Lebovitz, I was raised on the thick stuff. I was down in my parents home village a few months ago and found out that the original version was made with only water and maize and nothing more. Although, In between the bland- sustaining sips, it was customary to nibble on a piece of Piloncillo or handmade Chocolate de Metate. I recently posted on this in a visit to my friends home village in Jalisco. Pinole is my favorite though. Extra starchy, coarse-ground toasted purple corn that thickens twice as much. I top my extra thick corn drink with a dallop of whipped cream and finish it with a crumbled Masapan (Mexican peanut candy) for a complete meal/dessert. I am going to go make this RIGHT NOW. Thank you! 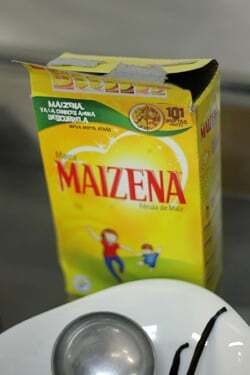 I grew up drinking flavored Maizena (it comes in packets with different flavors) as an occasional treat on a cold day. My favorites were coconut and chocolate–they have more of a… suggestion of the indicated flavor, though. I haven’t had it in years. I bet you can find some at HEB, in the ethnic aisle, while you’re in Texas if you’re willing to give it a try. If anything, the packaging with the small man holding a big cup of atole is cute! Thank you! I brought back so much vanilla from Mexico – and Paris and kept meaning to look for a recipe to use it with online. 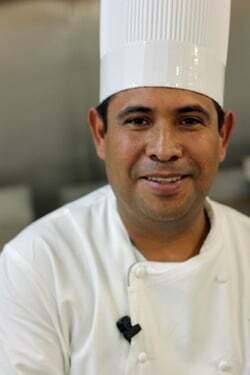 You may want to consider a trip to Mexican Home Cooking School outside of Tlaxcala! 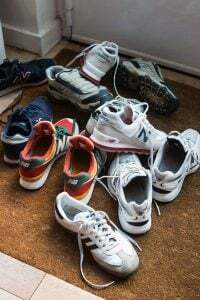 You have relaxed, small group classes in the am – afternoons are free – very relaxing. Tlaxcala is near Puebla – and has a luxury bus right from the airport in Mexico City. 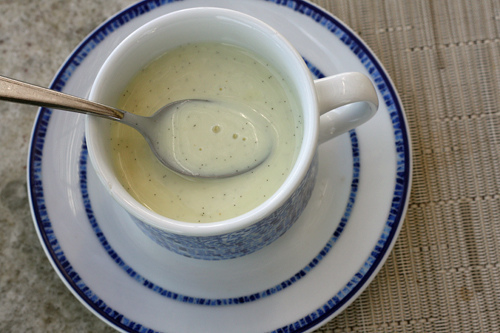 FYI- My grandmother would make atole whenever anyone one of us had a stomach ache. It works! Oh my heavens. It’s liquid pudding. Thank you so much for the recipe — this is going to get my through blizzard season in Boston! Oh, I know what I’m doing tonight. Muchas gracias. I’m sorry i missed this treat, but I’ve got all the ingredients in the house including fine cornmeal. I wonder if it should spend some time in the mortar & pestle to get it more powdery. I’ll give it a try. The photos and story make it tough to pass on. I am not a fan of hot chocolate because it is too rich for me…and in any case I am much more of a vanilla person. But this…..this is ‘hot vanilla’ !! Why didn’t I know about this before ?!? How fast can I get to the store to buy Maizena ?! Thanks again David for sharing your food adventures with us all. I have no place but here to say thank you for your great advice, graciousness and overall good-spirited-ness–it was a great pleasure to meet you. I have some nice photos of vous to share on flickr, but battling deep snow and a nasty cold, so I will get to it eventually. Meanwhile, I may settle in with some atole now that I have a recipe. Thanks so much David for a making the Mexico experience so worthwhile. true Mexican cuisine is something I don’t find a lot here in Colorado…but it truly is an art and has some of the most unique flavors! The best is to start with fresh ground masa (not prepared for tamales)… quantity.. about 2 tablespoons per cup of liquid. If that is not available then Masa Harina is preferable over Maizena… about 1 tablespoon dry per cup of liquid. Sally: Being a curious fellow, I lifted the lid on everything to take a look. The huitlachoche was there, as was the atole (although with multiple dining rooms, there was a lot to choose from). Glad you had a good time in Mexico. I had a blast as well, and miss everyone! EatNopales: Yes, there are more traditional ways of making this. I don’t have access to masa but linked to a few recipes I found that make atole using various methods. I’m sure that masa or cornmeal gives a different flavor than maizena, which is for certain a modern touch. Your post reminds me of, and makes me miss, the wonderful people in Mexico and the way time seems to slow down. 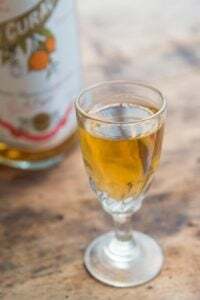 Another favorite Mexican beverage I love is tejate (made with cacao, cinnamon, mamey seeds), served in Oaxaca – if you haven’t tried, it, you should add it to your list! this is pretty much how i make pudding. the proportions of milk to corn starch are a bit different, which makes the atole not quite as thick. and of course i usually end up adding chocolate and cayenne, but at heart, this is vanilla pudding, which is wonderful. i like the idea of pretty much eating it whenever. Beautiful post! I admire your curiosity and absolutely love your posts that go “behind the scenes”. When I lived in Mexico for a summer I got to try atole and am anxious to give this recipe a whirl, it looks so decadent and luscious. Mmmm, this sounds delicious. I can spin my cornmeal in my coffee grinder that I keep for spices. Do you think cooled atole would make a good base, instead of regular milk, for milkshakes? 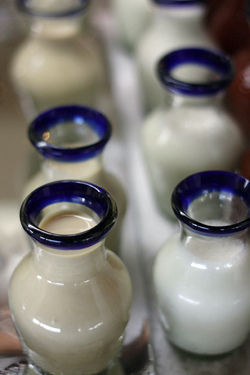 Diana Kennedy has several atole variations, most with chocolate included, in her amazing “Oaxaca al Gusto”. I got the book for xmas and I am still reading through it. I want to try one of her atoles and a mole asap (No Iguana Tamales for me though..thank you very much). A short-cut version of atole is made with cornstarch (brand name, Maizena), but the traditional way is to thicken it with masa, the same corn dough used to make tortillas, as EatNopales comments. When you use masa, the atole needs to be strained to remove little lumps, but the extra work is worth it, because of the wonderful, corn flavor, something lacking in cornstarch. In Mexico. Masa for making atole is purchased at the local tortilleria. Atole is served with tamales, the way Coke is served with hamburgers in the US. Despite the awful news, Mexico is a safe place to visit, if you keep your nose clean and avoid the border area. The condos, hotels and beaches are full in my part of Mexico, near Puerto Vallarta. My mother is Mexican and I grew up drinking atole. (We called it “toh” and still do because I was a little kid and couldn’t pronounce it.) Her version was much runnier though, and involves oatmeal. I was pleased and surprised to see it here on your blog! Makes me want to look around for other varieties. Thanks for sharing. je must make this right away. It’s funny..up until now, in my many visits to Paris, I hadn’t experienced the outright line craziness you have described personally. I had seen it in action, had a few mild bumps, but was otherwise unscathed. Not any longer. On the 2nd of January, at the post office, a woman skipped to the front to drop off a posted letter. I was next in line. No big deal. It was already stamped. The same etiquette exists here in the states. Well, the tiny old lady at the end of the line took this as a sign that she could do the same, told me she just had a letter to hand to the postal worker and I said ok. Well, her letter was not stamped. She plonked her cane heavily onto the counter, dug through her purse, signed the card, hemmed and hawed over which stamps to buy, talked to the postman, and counted out exact change in pennies. The line changed from resignation to antsy and perturbed, luckily not directed at me, but at the transaction going on in front of me. Sacre Bleu! Do you have any recommendations on brands of vanilla to look for in Mexico? My parents go every year for a few weeks (they’re leaving in a few days) and always ask me what I want them to bring me. I’ve had them bring vanilla in the past, but wasn’t happy with what they brought – probably the tourist stuff you mention above. But even stuff labled “pure and organic” has been a little cloying. Any Mexican vanilla tips or guidance (for buying IN Mexico) you can pass along would be super appreciated! Susan is thinking like me. I immediately thought maybe it would be a good ice cream base as well as milkshakes?? Wow, I love learning about different cuisines around the world. Thanks so much for sharing this. Atole looks delicious. If it has vanilla it’s pretty much guaranteed I will love it. David — would you share your source and/or name of the mexican vanilla that you buy for your “house” vanilla? oh thank you for this. i am loving this, have heard of it before but forgot about it till now. and yes, exceptional vanilla does come from mexico. wonderful post david! thank you! so good to see this highlight of mexico! my husband and i are traveling to the mayan riviera (staying at the valentin imperial) next week! did you have any other great dining experiences in the area during your stay? and restaurants/food carts/authentic cuisine not to miss?!? 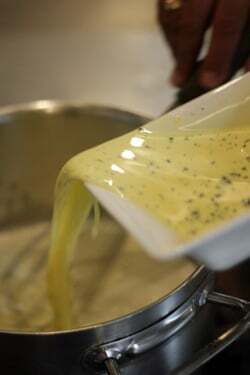 we call this custard in Lebanon muhallabieh, except we use orange blossom water with it. The first time I had Atole was in Zacatecas, and it was, and still looks from what I remembered. At last! A hot chocolate for vanilla lovers! Glad to read that you are back safely. Atole looks like a attracting, wondering if it got any relation with Tahiti Atole. David, this post is quite an eye opener. I read through the link about imitation vanilla and discovered the tonka bean. I didn’t know this causes blood thinning and is banned in the US. 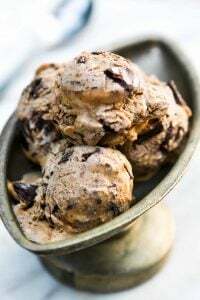 I worry though that Tonka Bean is actually used by reputable chocolatiers in some countries. I assume it’s not banned in the UK? Thornton’s has a tonka bean bar and I’ve tried it when a friend brought some after visiting London. It was good. But wow, I didn’t know these beans pack something sneaky! 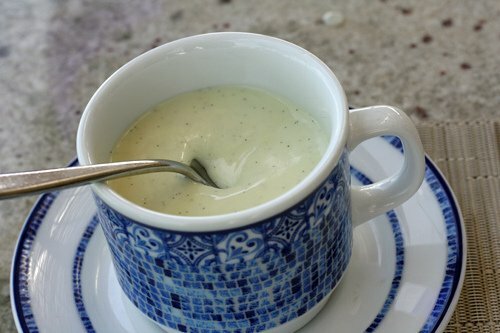 We make something similar in Puerto Rico called…Crema de Maizena! Ja! Same ingredients used in Atole, but I admit most of the time I use pure vanilla extract instead of the vanilla bean for flavor. Ah, I also add a pinch of salt. It is truly one of my children’s favorite dessert alternatives on weekends. My grandmother showed me how to make it as a young girl. 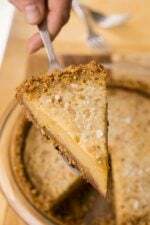 Spanish “Natillas” are very similar, but you add a little cinnamon as well and lemon rind for flavor. beautiful pictures and informative. ¡ Gracias! sorry i made a typo and put dessert, i must have written breakfast on weekends! sorry! I love atole. My mom made it this Christmas with maseca dough. It was amazing! Her version was chocolatey and well complimented the spicy tamales she brought to dinner. There is nothing that tops those drinks I had as a child. In Mexico, my aunt is known for her atole recipe and the church often asks her to contribute a pot to sell at the fair when they are trying to raise money. Wonderful! Thanks for the recipe. Show me someone who doesn’t breathe in deeply when faced with a vanilla pod, and I’ll show you a lunatic ;) Thank you for this recipe – I’ve never seen anything like it! 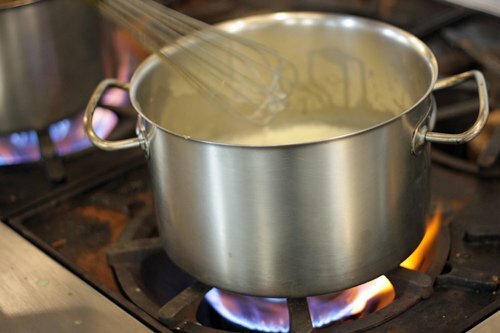 great post and for me a very proud coincidence–I decided to try making “English drinking custard” or creme Anglaise this past Christmas to have around and to give away as gifts to friends. At first I could not get the consistency right (too thin) until I added corn flour, and then like magic, it all came together. I thought I was cheating the process, but it turned out so good I couldn’t care less. I had no idea this beverage is enjoyed in Mexico. Thank you for posting. Oooooh, something new and fabulous!! I’ve never heard of this before– so excited to learn of a new custom!! Looks delicious. 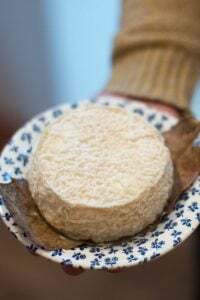 I had some with a piece of toasted brioche, for dessert , this last xmas. Can’t wait to try your recipe. I like the vanilla bean idea, we always make it with cinnamon. Wina: Glad you like the photos! I list my gear in the post My Food Photography Gear. Aji: I dislike the taste of tonka bean immensely so don’t eat it. But they do contain the same ingredient as the artificial vanilla with the suspect ingredients. Jenny: I get my vanilla from Patricia Rain, who only sells wholesale now. I linked to the vanilla at the end of the post to a company that sells it online. And I also linked to a post at Vanillaqueen.com, which is Patricia’s site. Her Mexican vanilla is really the best. Shannon and Susan: I do make ice cream with corn starch sometimes (I have a recipe in my ice cream book) but this is very low in sugar and would freeze quite hard. So you’d want to add about 3/4-1 cup more sugar to this recipe, but I haven’t tried it so that’s just an estimate if you want to give it a go. Joanna: I don’t know the brands in Mexico and as I wrote above, I buy Mexican vanilla in the US where it’s about the same price as the (real) vanilla in Mexico. And that way, I am certain as to what I am getting. Cooking in Mexico. I love masa but I only know one place in Paris that sells it, and it’s €18 (about $24) a bag. I am probably going to play around with a few variations of this when I get home so perhaps I should bring a bag back! photos. Read the blog on food pics you linked on FB, so now I’ve cracked the code. I know how you do it! Spoon in the bowl in first photo, oooh. The pouring shot, aaaah. Want more! I loved the smell of this drink and am so glad that you included your session with the chefs as one of your posts. Mexican vanilla is also my favorite as well and it is a bit easier to get here in Ca. This drink definitely appeals on a cold morning or afternoon and is a wonderful change from hot chocolate. I have some some masa in the refrigerator and so I am going to try it with that. Thank you for sharing your insights and experience with us and for being such a gracious host!!! I’m definitely trying these recipe. I had almost forgotten about Atole. I remember a friend’s mom preparing it from scratch as a breakfast food in Zacatecas. During Christmas time, there are lots of street stalls that sell it, even in chocolate versions. When I later visited Spain and had a Spanish Chocolate, I wondered if they had taken the idea from Atole. 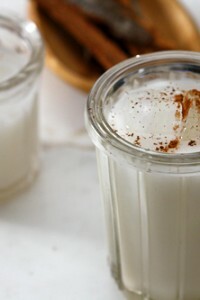 The vanilla bean, I have never seen in it, but I will most definitely be making this version sometime today! Thanks for the post. This looks so yummy and comforting. Would love to try it! Thanks for sharing. I’m Mexican and It feels so good listening to you talking about my country in such a good way. Thank you and I hope you go back soon. to find, no matter where you go. And what a great gift if you shared the beans with your friends and family! Enjoy Mexico and the laid back attitude around you. What a great vacation to book in the middle of a grey, european winter! Eat as much mole as you can and I will try to live vicariously… Then brace yourself for re-entry into Paris! I am such a fan of your blog, and I have been so happy about your latest post about Mexico, since I am mexican. You trully have to arrange for a more in depth trip to Mexico, but visit different regions, our food is so different from coast to coast. You are missing all the nice fattening foods form central Mexico such as sopes, tostadas, quesadillas with no cheese (wich people always argue with are not quesadillas anymore, but that what we know them for). Northern Mexico food, Pacific Coast region, Gulf Coast Reagion, etc. If you ever want to get to know the area of Michoacan and Estado de Mexico, you are mostly welcome to come to my house, and I will gladly show you all around, just let me know. Have fun in Texas, and have some fajitas with iced tea for me. My son looked at this with a big smile. He loves anything with fresh vanilla beans. Thanks for sharing. I will be making this for the family soon. Have a great day. I made this last night for a desert/drink and it was fantastic. Since moving to Canada, our availability to mexican cuisine has been greatly limited so I’ve started making it at home. 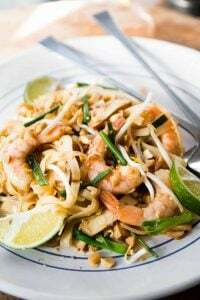 This recipe is quick, delicious, and a keeper! Yes, you must bring a bag of masa back to Paris if you want to make the best tasting atole. Then you can make champurrado, also. As I mentioned before, when made with masa, atole needs to be strained. Years ago, before Mexico wasn’t as developed as it is now, we found sieves made of horse hair in a market, meant for straining atole. I bought a set, but have never used them for this purpose. They are part of my collection of culinary artifacts of Mexico that are quickly disappearing. The pre-colombian people of the Anahuac Valley & Xochimilco basic (basically Mexico City & surrounding areas) made Atole from various combinations of Masa, Pinole (toasted dried masa), ground Amaranth seeds, ground Chia seeds. This may be true for other parts of Mesoamerica as well. The addition of Amaranth & Chia was brilliant because it forms a fairly complete protein, adds essential fatty acids & minerals. Atoles in Contemporary Mexico are still made with those ancient foods as well as the Oatmeal you mention, Barley & wheat. One more comment… an interesting variation of Atole is the Oaxacan dessert Nicuatole which is basically like a white translucent flan made from masa often served with a prickly pear syrup. How wonderful that you were here in the Yucatán. I’m glad you enjoyed your trip and it is really wonderful to read such nice things about my adopted country. Atole is really a cold weather drink and is more popular in the highlands than the tropical areas. We have it here in Mérida but it is not sold on every corner in the winter as it is in colder areas. For some reason, Yucatecans often call it pozole which was very confusing to me at first. Pozole is a wonderful pork and hominy soup that is also from the highlands, I’m not sure how they mixed the names here. Whatever it is called, I love it with vanilla and cinnamon. 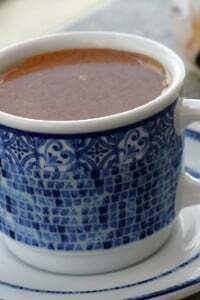 Champurrado is, rather than Mexican hot chocolate, a sort of atole. Hi Robert: What’s the difference between atole and Mexican hot chocolate? I always thought that the original Mexican hot chocolate was cornmeal mixed with chocolate (to extend the flavor of chocolate, when it was rare). And thought that atole, or champurrado, was just another name for that. So am wondering if there is a definite difference? Claudia: I would love to see more of Mexico. I’ve been to various places but not extensively traveled through the country. Mexican hot chocolate, tipically, is made with water and a tablilla de chocolate, which is a mix of chocolate, cinnamon, sugar and almonds ground all together and then the resultant paste is molded into a disc, in Mexico you can find some churrerias that sell all kinds of hot chocolate, mexican, spanish, french. Spanish hot chocolate is made with milk, chocolate, sugar and, sometimes, thickened with maicena (corn startch), usually, you can find hot chocolate in churrerias (places that sell churros and hot chocolate and, sometimes, even tortas). Champurrado is, tipically, a chocolate atole made with water, masa de maiz (), piloncillo (raw sugar, a type of molasse in a cone shape) and tablilla de chocolate but now there are people that made champurrado with milk, sugar, masa de maiz, vanilla and chocolate. You can find champurrado with the people that sells tamales. So, hot chocolate is for churros and champurrado is for tamales. @ Jonna Its actually Pozol… the word means liquid thickened with corn. The most traditional (Pre-Hispanic) Pozol did not have pork of course.. and didn’t necessarily have meat in it. 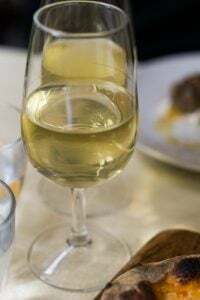 The most important idea was to create a voluptious but translucent liquid aromatized by the very fragant dried corn that could be prepared as a drink, soup or sauce base. It just happens to be that the common incarnation of Pozole in Jalisco’s rural cenadurias with its Guajillo chile & Pork has come to define the word… especially given the vast number of Jalisco emigrants to the U.S. & Mexico City. @ David & Edna… Traditional Mexican chocolate is made by slowly roasting & grinding cacao beans in a metate adding water & sometimes various spice combinations (chile, allspice, vanilla, achiote are most common)… and just a small amount of wild honey to reduce some of the bitterness.. but in generally it has traditionally been consumed (for 3,000) years similar to black coffee. Now in modernity, urban Mexicans have gotten lazy & forgotten how to make a proper Xocolatl so we have became slaves of the Consumer Packaged Goods companies… however throughout Southern Mexico there are still many people who know how to make an authentic Mexican hot chocolate. In my lazy method I forgo the tablet all together and use dark chocolate chunks or chips to start with. Also David… Masa is not Cornmeal as Masa is nixtamalized… but I don’t think Masa has ever been used as an extender… rather Cacao is used as a flavoring agent for the Masa. You have to be in the Yucatan at 100 degrees with 80% humidity to understand how refreshing an iced Pozol can be (the combination of maza & water is particularly fresh for some odd reason). And of course you need to be in the Central Highlands at 5AM during winter to understand why people start the day with a big mug of steaming Champurrado. As background… since PreHispanic times continuing to the last 200 years, Mexicans have traditionally drunk Atoles first thing in the morning to fuel the morning labors prior then had a large meal in the mid morning with progressively smaller meals later in the day… and that is the context in which Atole, Champurrado etc., need to be assessed… it needs to sustain you through a highly physically active early morning without making you jittery (which would happen if you drank enough Xocolatl to fuel the 4 to 5 hours between waking & having the first meal). Placed 2 cups of milk, 2 tablespoons of masa harina, 2 tablespoons of sugar & a big pour of vanilla extract (which I had some beans in the cupboard)… whipped it all up with an immersion blender & brought it to a pre-boil at medium heat…. no lumps. Shockingly, you can find Masa Harina in The Netherlands (well, Amsterdam) fairly easily and it’s not that expensive (I can’t remember how much I paid but certainly not 18 euros!). After 2 years deprived of corn tortillas, I was delighted when I finally found it and am working on perfecting homemade tortillas. And from today, atole, which I’m excited to try with the masa harina (since, on the other hand, cornstarch is really hard to find! How curious!). Just tried it, it should have the consistency of eggnog, right? I’d never heard of atole before and I’ve just made some, it was delicious. As I only had regular vanilla beans on hand, I used some lavender and vanilla sugar – probably not authentic but a very enjoyable plan B! That atole looks amazing. I was looking at a recipe for that in a magazine and really wanted to try it but was out of vanilla beans. Thanks for the link to my Champurrado! I am so happy to hear you had a nice and delicious time in Mexico. As several have mentioned and explained, mexican hot chocolate and champurrado are indeed two distinct beasts. My favorite atole is my grandmother’s speciality– guava atole made from fresh masa. We make it pretty much every time we are together. You are right, the masa does give it a distinct flavor. Though not as delicious as fresh masa from a good mill, you can also use Maseca (http://mimaseca.com/en/productos/), a commercial brand of instant nixtamalized (http://en.wikipedia.org/wiki/Nixtamalization) maize flour. 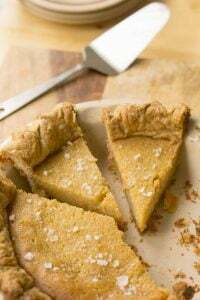 It works decently well and shouldn’t be so hard to find– and you’ll definitely experience the flavoring that maize gives atole. I’ve been to Mexico a dozen times, and then I lucked out even more when my brother married a lovely Mexican woman. I even eat the street food, especially the ceviche and any kind of tamale offered. This is vanilla atole, but you might also try atole de canela (cinnamon atole) which I prefer. With the pure vanilla version, I find it too sweet and too flour-y, especially when it cools off. The cinnamon version is a bit spicier, which is a bit more palatable for me. You seem to be missing the butter – perhaps this is a regional variation in the recipe? As far as shopping tips for vanilla, all you have to do is look for the beans at any local market. In northern Mexico, the markets you are looking for are called “tianguis” – which are the street markets selling local produce. There will probably be a local bus service to the tianguis. “Mercados” which you might have learned in high school Spanish are fixed locations, probably open every day, probably selling clothing, leather, etc. along with some food no doubt, but not the best for what you are looking for. You will probably pay by the kilo, and one 1 kilo is about 2.5 pounds which is more than you can handle before they go rancid. I buy a “medio kilo” (half-kilo ~1.25 lbs) of canela (cinnamon) sold in dried stick form and it lasts me over a year, and the little lady loves me. A “quarto kilo” (quarter kilo ~0.75lbs) is still probably a lot of vanilla beans, but you could freeze them. In the tianguis that I am familiar with, I just grab a handful and put them on the scale, or hand them to the vendor with big sheepish smile like other Americans! Gotta love atole ! in the capital of Mexico, they drink it along with a tamale-sandwich a mysterious yet not so disgusting carbohydrate redundance. we’re having a hard freeze tonight (unusual for Houston) so I finally made this, and subbed masa harina for the cornstarch. deeeeeelicious. I put in a little cinnamon too as it seemed a very Mexican thing to do. OMG Atole with oatmeal!!!!! At a hotel!! !Sorry David, atole is made with the dough that you prepare tortillas with, plus milk, fruit and maybe a little bit of cornmeal. We drink atole with tamales and also with other things, but it is the perfect accoimpanient for tamales. When you come to Puerto Vallarta let us know and we will show you the best pinapple atole there is…I am now living and Paris and enjoy your website.